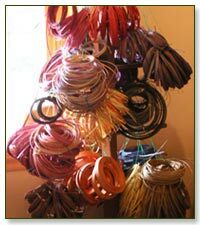 At Pinelands, you can always find basketry supplies for your own creation, or for one of our classes. All types of reed, rattan, handles, tools, etc., are available. Among the many different materials that Mary uses in her own basketry are: rattan (primary material), brown ash splints, hickory run, elm bark, birch bark, bittersweet, cattail, basswood bark, dog bane, yucca, sea grass, driftwood, sweetgrass, antlers, gourds, pine needles, etc. In fact, there's not much we don't use here at Pinelands — so Mary always has a wide range of supplies available. 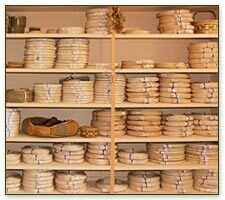 Whatever your basketry supply needs, you are sure to find the right supplies! And we don't just stock supplies. Mary provides frendly, personalized service for all levels of basket weavers, from brand new beginners to advanced and experienced crafts workers. She would be happy to help locate any supplies you need. If you are in search of an unusual supply, please contact Mary to check on availability before coming to to the shop.